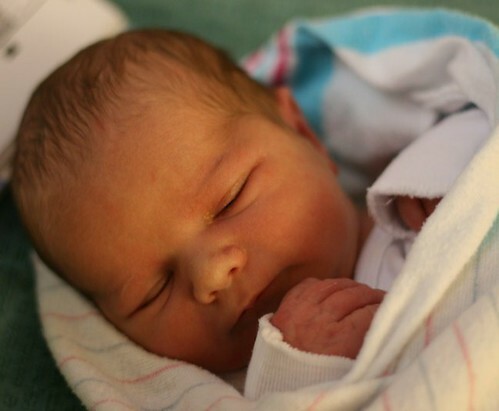 First, here is a picture of sweet Harrison, my new nephew. Oh, I ache to hold him in my arms! He's so precious! Thankfully, we are going to Florida in a few weeks and I'll be able to see him then! What a beautiful baby! The Earth Sampler looks great. I'll have to get that one for myself. Have a good evening. Harrison is just beautiful! What a wonderful newborn picture! Earth Sampler looks awesome. Harrison is absolutely gorgeous! I know he's a boy, but still! What a perfect little baby! And your Earth Sampler -- sigh. Love it! Gorgeous baby boy Nicole! Your Earth Sampler is lovely too. I ordered that one for myself. Harrison is adorable! I just want to squeeze those little cheeks of his! Earth Sampler is coming along nicely! Good luck with getting the kids under control! Well, congratulations Auntie Nicole. Harrison is really cute! Earth Sampler is looking wonderful! Oh isn't he just too sweet! I so miss that age...(sounds crazy with 5 I know). Give him a squeeze for me! oh my word what a cutie!!! He's a cutie. Love the ES. Welcome to the world sweet boy! Oh, I love babies! He's absolutely precious. Oh my gosh! There is nothing in the world sweeter than a new baby, and he is beautiful! Enjoy him Nicole, when you get your hands on him! Congratulations, Harrison is so sweet ! Earth Sampler is just lovely!!!!! I'm starting to think I need to get one, too!!! Absolutely beautiful baby! He looks perfect. Congrats!! he is absolutely beautiful! how precious. earth sampler is looking great! Harrison is beautiful! Your earth sampler looks great. Harrison is so sweet! Welcome! Be happy, little boy! Love how your Earth Sampler is coming along! That baby is very kissable--WAY kissable! Those cheeks!!!!!!! Simply adorable. I love your Earth Sampler too. Great colors! adorable baby boy!!! Makes me anxious!!!!!! My DIL is expecting triplets this summer & all are boys!!!! Earth Sampler is gorgeous!!! Keep up the great work! What a beautiful little baby Harrison is. Your Earth Sampler looks gorgeous and will be done very soon on it. I'm curious to see how you will finish it. Harrison is just gorgeous, Nicole! ES is looking great. It looks like fun. Oh, your nephew is adorable! And Earth Sampler looks wonderful! Makes me want to get it and start! Harrison is absolutely beautiful! So glad you'll get to see him soon. 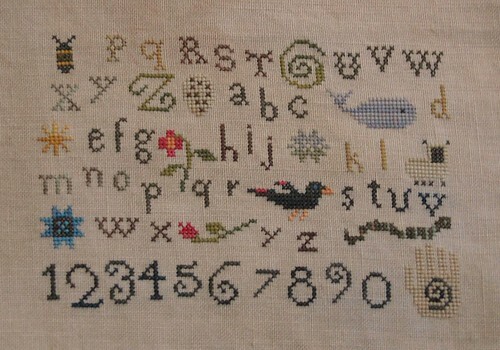 Love your progress on the Earth Sampler!!! What a beautiful baby! Your nephew is absolutely darling!!! Nicole, Harrison is so sweet! I know you will be glad to see him. I love your Earth Sampler - it's lovely - so I've added the design to my "to do" list! Wonderful progress on the Earth Sampler. I like that whale. Harrison is just so precious!!! What a beautiful baby!!!! Love the stitching as well! Beautiful baby! I know you are holding your breath waiting to hold him. Hope Mom is doing well also. Harrison is adorable! Congrats on the new member of your family. Your Earth Sampler looks wonderful! Your little nephew is so beautiful and he looks happy too! Earth Sampler is so pretty and I love the little whale in it too! Harrison is beautiful. Love your Earth Sampler, it's beautiful too. What a perfect little boy, absolutely beautiful. What a gorgeous baby! He's so sweet, hope you get to cuddle with him soon. Your ES looks great, isn't it a fun stitch! What a sweet, sweet babe! I bet you just ache to hold him. It's so hard to be away from family... I felt almost bereft when my niece was born & I couldn't hold her right away. Your Earth Sampler is FABULOUS!! Che amore è bellissimo, complimenti.